In Mathematical Go, Berlekamp and Wolfe introduce the idea of prisoner return. It is an additional rule to be applied to no-pass Go. With prisoner return, instead of making a move on the board, a player can return a prisoner (taken earlier) to their opponent. This is like a pass stone, except that, first, a player can only return prisoners so long as they have prisoners remaining; second, consecutive prisoner returns do not end the game, instead, as in no-pass Go, the first player without a valid move loses. Correct play will be for players to fill in their own territory, but two eyes must be left in each group and so there is effectively a group tax, as with stone scoring. As such, it is very close to the oldest known form of scoring. The structure of territory matters beyond life. 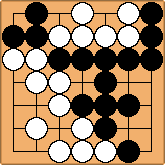 No-pass Go gives White the win after three nakade and one fill. Prisoner return instead lets Black prevail easily, as expected. luigi87: It would be very interesting to see examples where this gives a different result than stone scoring. Bill: That’s easy. On an odd board, if there is not an odd number of dame left in seki and Black plays the last dame, the result is one point less for Black than stone scoring (with possible rare exceptions). 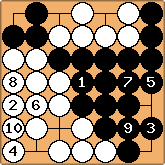 No pass go leads to territory scoring, although how to count territory and prisoners depends upon the form of no pass go. Anon: I think this illustrates Bill’s comment. Black is now forced to play at 'a', and so loses. The game would have been a draw using stone counting (or Chinese counting), so it’s equivalent to half a point komi for White using either of those two methods. Bill seems to be talking about territory scoring versus stone scoring. Even if there is an odd number of dame in seki here.